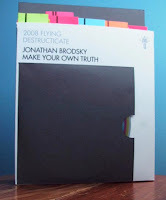 Last winter I participated in the second installment of Jonathan Brodsky's collaborative performance series with the folks at Encyclopedia Destructica, which they call BYOPPT - Bring Your Own Power Point. The night consists of over a dozen lightning-fast presentations on a myriad of random subjects, the only restrictions being 1.) 20 slides, with no more than 20 seconds of talking per slide, and 2.) you cannot present on the content of your day job. My presentation was about Alexander Berkman's attempted assasination of Henry Clay Frick during the Battle of Homestead in 1892, and his friends' subsequent and daring attempt to tunnel him out of prison in 1900. Starting in 2007, the folks at Encyclopedia Destructica have picked a guest artist to do a book at the culmination of their publishing year, their honorary "Flying Destructicate". Jon is the 2008 Destructicate (Josh Tonies was 2007), and in this capacity surprised me by asking me to transcribe my PowerPoint from the BYOPPT event for inclusion into his Flying Destructicate book for 2008, entitled "Make Your Own Truth". I wasn't feeling like my actual presentation was nearly as articulate enough to warrant transcription, and also felt like an analysis of the Berkman situation as a whole would require a much fuller account than I was going to have time to hash out in the sudden - and tight - deadline space. So instead I generated a rather ridiculous multiple choice quiz for readers, one question per slide. Hopefully my contribution does as much to educate as it does to pull a laugh or two, without ridiculing the story itself. True to form, the folks at ED just keep getting better and better at the books they put out. 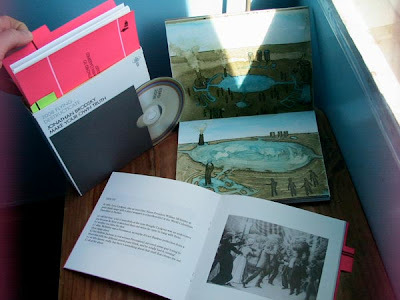 "Make Your Own Truth is a really well crafted affair, complete with a bound book, inserts with Powerpoint presentations transcribed (or otherwise), and a DVD of video and animations by Alberto Almaraz, Rick Gribenas, and Brodsky. Other participating artists include Juliacks, Paus Akid, Josh Atlas, M. Callen, T. Foley, Curt Gettman, Brett Kashmere, Laura Miller, Greg Siegle, and Jim Storch.